Verizon iPhone Is Real, Is 3G and Is a Hotspot. The debate about whether a Verizon iPhone is coming is no longer up for speculation. Verizon Wireless (s vz) confirmed one of the most talked about rumors in technology by unveiling the iPhone 4 (s aapl) on its network today at an event in New York. “We welcome this game-changing device to our network and to our Verizon family,” said Dan Mead, CEO of Verizon Wireless. The device, available for pre-order for existing Verizon customers on Feb. 3, is very similar to the current iPhone on AT&T (s t) but will work on Verizon’s 3G CDMA network. It will sell for $199.99 for a 16 GB version and $299.99 for a 32 GB unit. Mead said the phone will become broadly available at Verizon and Apple stores on Feb. 10 and will come to Verizon resellers later. While the phone is largely the same as its GSM counterpart, it will offer a personal Wi-Fi hotspot feature to connect five Wi-Fi devices. Also, because it’s a CDMA device, the iPhone 4 will not be able to handle voice calls and a data connection at the same time. Mead declined to talk about data pricing for the iPhone 4. Cook said Apple took at look at LTE but said the faster network would require design changes that Apple wasn’t happy with. He said Apple was also anxious to answer the No. 1 desire of consumers for a Verizon iPhone. 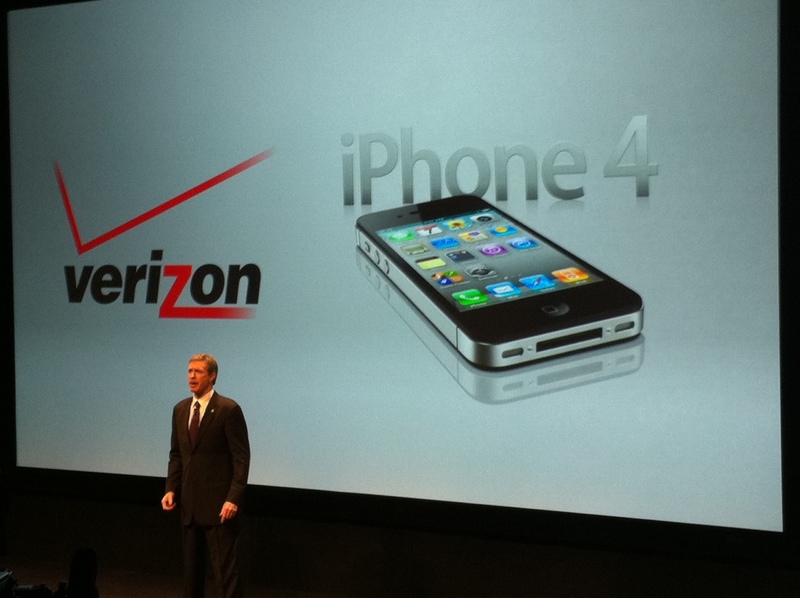 Mead said Verizon is prepared for the added strain of the iPhone 4 and has tested the iPhone 4 on Verizon’s network. He said the company has added capacity to handle the additional users it expects. “We have advanced the capacity and built margin into the network throughout the country so we are ready for this launch,” Mead said. There are still questions to be answered. It’s unclear how easy it will be for Verizon customers still on contract to upgrade to the iPhone 4. There’s no sense if the next iPhone 5 for CDMA will quickly follow this version later this summer, when it’s expected to debut. It’s also not clear if Sprint (s S) could also be in line for the iPhone at some point, though Cook said Apple had been in talks with Verizon about the phone all the back to 2008 and began testing the device a year later. Verizon, if you recall, actually had first crack at the iPhone but reportedly turned Apple down. The move allowed AT&T to become the leader in smartphones with an estimated 38 percent of its devices smartphones, compared to 30 percent for Verizon. While Verizon has made up for the lack of the iPhone with a bevy of Android (s goog) devices, recent data suggested the carrier was having a hard time keeping up with iPhone sales in the third quarter. Verizon’s vaunted network, tops in the latest Consumer Reports survey, will be under the spotlight with the addition of millions of new iPhone users but should be up to the challenge. As my colleague Kevin pointed out, Verizon has prepared its network for a lot of data and is rolling out 4G LTE, which should also ease overall demand. Analysts believe Apple could see a significant bump of 9 to 12 million iPhone units in 2011 thanks to its Verizon deal. Apple sold about 15 million iPhones in the U.S. last year through AT&T. The effect of the iPhone may not be immediate on AT&T. Credit Suisse recently estimated that AT&T had about 18.4 million iPhone subscribers at the end of last year, with 15.9 million, or 86 percent under contract. Many users will have to pay to get out of their contracts if they want to jump immediately. And with an estimated 80 percent of iPhone users on family or business plans, switching at the end of their contract might not an easy option. Still, customer defections from AT&T to Verizon could amount of anywhere from 1 to 6 million, according to analysts. The Verizon iPhone should heighten the rivalry between AT&T and Verizon, as both networks compete on more equal footing. AT&T, for its part, appears poised to go after Verizon on speed and will reportedly play up its speedy 3G network. Google’s Android could see a jolt with the introduction of the iPhone on Verizon, which was the biggest U.S. carrier for Android devices. If the iPhone proves as popular on Verizon as it does on AT&T, where iPhones accounted for 80 percent of smartphone sales in the third quarter of last year, it could cut into the fast growth Android has experienced. What about FaceTime? Can Verizon handle it on the network without having to use WiFi? No mention of the Verizon SVDO update mentioned off and on since last spring that would facilitate simultaneous talk and data. It is quite a mystery why the US still use CDMA networks, I thought the world had standised on GSM ? Also after using an iphone for a couple of years I have a started using an Android os phone…what a breath of fresh air after the padded prision of the iphone. So I would be surprised if Android phones will be badly effected as the long term directory of the iphone is a lower proportion of the smart phone market. Not really a mystery at all, Martin: the largest carrier in the U.S. invested billions in a 3G CDMA network so it wouldn’t be cost effective to make the transition until 4G. That’s what Verizon is doing by using LTE, which is GSM-based. LTE will be data-only first, but the carrier plans to move voice traffic to LTE in the future. This is a bad news for phone makers of the high end Android phones like Motorola or Samsung. But other than that, I don’t think it will affect Android too much. It would have been much worse for Android if this deal would have come a year ago. Yes, Android in general is going to be keep rocking especially as it gets into cheaper and cheaper phones. But yeah, I’d love to have seen the impact if Apple had struck this deal a year earlier. Android probably wouldn’t be flying so high in the U.S.
Well of course they couldn’t strike that deal because of the AT&T exclusivity, but the AT&T deal may have been shortened from 5 to 4 years because of contingency clauses, perhaps involving the number of competing handsets at AT&T which were Android. So it all happened as fast as it could. Same questions as always: so what if Verizon is getting iPhone 4 in February. What happens in June when iPhone 5 launches? Are all early adopters on Verizon left out? Will the iPhone 5 launch on AT&T and Verizon at the same time? This is going to be an interesting question. Verizon could get the iPhone 5 this summer at the same time AT&T does. My guess is really savvy consumers will wait and see but for some customers who just want an iPhone on Verizon, Apple and Verizon can say here you go. It’s a risk but that’s always the case with technology. There’s always something better a few months down the road. There is also a possibility an iPhone 5 on Verizon could take longer to come out but Apple never gives any indication either way. So it’s really about how much do you need a Verizon iPhone right now? Now that the iPhone has been re-engineered to use the CDMA network can a U.S. Cellular or Sprint iPhone be far behind? I’m sure there is some exclusivity agreement between Verizon and Apple, but I’m betting Mr. Jobs won’t have the duration as long as he did with AT&T. He’s not going to make that mistake twice. Good, now people have choice in the US. It would be interesting to know the impact on Android. Also, would Apple follow up with a Sprint and a T-Mobile deal? Ryan – not sure why the focus is all on AT&T in terms of subscriber loss. My thinking is that they will be impacted – but not nearly as much as TMO or Sprint, who certainly house a number of customers who want an iPhone but were unwilling to go to AT&T (the “network” argument) while AT&T iPhone customers have – in many cases – come to terms with whatever failings the network may or may not have in their areas. Good points. I’m sure we’ll address them in a follow up. But yes, the impacts could be broadly felt beyond just Android and AT&T. Thanks for the comment.